Since this blog is sub-titled retail history, I figured that our inaugural mall from the Granite State might as well be, um, history. The Nashua Mall was the first enclosed shopping mall built in New Hampshire, opening in 1969. The 350,000 square foot, 35-ish store, simply laid-out dumbell mall served for many years as the sole enclosed mall serving the city of Nashua, which sits on the Massachusetts state line. Originally, the mall itself hosted Woolco and Almy’s as anchor stores, and the sprawling outlots included a Montgomey Ward, a large plaza with (I think) a supermarket, Child World, and–probably built sometime later–a Shop ‘N Save/Hannaford supermarket. There were some expected shifts, with the roster of anchors you see above: mainly that the Woolco became a Bradlees in the mid-1980s, Almy’s became a Burlington Coat Factory in the late 1980s, and the Montgomery Ward (which closed in 1997) became an Ames before that store also closed in 2002. It looked extremely old, because it clearly never received a significant face-lift during its entire lifetime. I wish I’d had the foresight to snap some pictures before it was too late, because the Nashua Mall was truly a gem. Despite that it was one straight-shot hallway, it was wide and with high ceilings, decorated with diagonal wood paneling and extremely groovy, dangling 1960s vintage light fixtures. The high ceilings employed an old Frank Lloyd Wright architectural trick (though I seriously doubt it was intentional) wherein there were dramatic changes in the ceiling elevation, causing some “low” areas broken by very “high” areas. Wright built this into many of his structures to cause people to move throughout the building, because lower ceilings in hallways and foyers encouraged people to move towards the more open central areas. Oh, there was also a beat up penny fountain in the center court, and Bradlees had a massive wall clock at the front of their store. A change in demographics in the Nashua area. Unlike most malls that die, Nashua’s demographics improved as the city experienced a major development boom throughout the 1980s and 1990s. Included in this boom was the new Pheasant Lane Mall, a large two level mall constructed on Daniel Webster Highway on the state line on Nashua’s extreme south side. Because the New Hampshire border towns are a popular place to shop for Massachusetts residents due to the lack of sales tax, this mall would become widely popular and steal much of the business away from the Nashua Mall on the city’s northwest side. Similarly, the sprawling northwestern corner of Nashua also developed its own major commercial strip, but it was all located one exit to the north along route 101a, away from the Nashua Mall. With a population of 85,000 proper and many dense suburbs located nearby, Nashua could’ve easily continued to support two malls, but the Nashua Mall never received the necessary cosmetic love to make it viable. Strangely, despite the mall’s horrendous condition, it soldiered on quite well until its death in the early 2000s and even included some mid-market tenants such as Brookstone and Cherry & Webb. The first major blow was when Bradlees closed with the entire chain in early 2001, leaving Burlington Coat Factory as the lone anchor. Kohl’s announced they would be taking the space, but they demolished the Bradlees building and built their own structure that was freestanding yet on roughly the same footprint. Not long after, the half of the mall closest to Burlington Coat Factory was shuttered and dramatically reworked to host a Christmas Tree Shop, which did also not have access to the mall. This left a small area of the original unrenovated enclosed mall for a couple of years. DeadMalls has some photos of it in this state. This final portion of the mall would close in early 2004. The last of the mall was bigboxed, and the center today hosts Kohl’s, Christmas Tree Shops, Burlington Coat Factory, LL Bean, Home Depot, and Starbucks amongst its anchor stores. If you happen to be in the area, make sure to take note of the Burlington Coat Factory store, which is the last vestige of the original mall–the building is even still in the old Almy’s style! Our friends over at From Woolworth to Wal-Mart have an even more complete history of the Nashua Mall, including a few more precise details than I’ve included here and some illustrative graphics to show how the mall used to look. The only truly original visual I have to offer up is the mall’s logo above–I scanned that off of a promotional flyer given out at the mall in 2000 or 2001. Despite the way it looks, it isn’t really *that* old! Want to see something really strange? I’m not sure how long it will last, but if you load the Ask.com map page and zoom in and out intermittently, you can see the footprint of the mall before and after its conversion to a strip center! And Here’s an old video of the Nashua Mall! Brookstone sharing a mall with Burlington Coat. Now I’ve heard everything. Work is under way as Chunkys cinima is movinging in to the space formally occupied by Ames on 150 Coliseum Ave. I grew up right near there! The supermarket was “Alexander’s” before it was bought out by Hannafords- they moved to a larger building just up the road. It was kind of sad, to see it get more decrepit and unloved with every visit back home. Good thing someone did something with the property. Chunky’s CinemaPub opened in January. Good to see something there, the building had been vacant for so long! The Hannaford’s next door has just started a much-needed renovation, too. I remember my grandmother and her sister, running to Woolco’s all the time after a visit to the “Greenridge Turkey Farm”. Woolco had cool stuff, a little dumpy, but they had everything. Chunkys did take half of the old ames store but left the rest looking horrendous. Ive never been inside so i dont know if they are actually using the whole building but it appears they only cared about the entrance looking nice. I remember my mom bringing me and my sister to bradlees in the nashua mall quite often for discount clothing. Right outside of bradlees near one of the main mall entrances I got my first and so far only pair of glasses. She used to bring us to the friendlys for lunch. And we would also go to burlington coat factory for other good priced clothing. Lets just say i didnt exactly have the coolest looking clothing in the mid to late 90’s. In the deadmalls.com photos there is a sign about the phones and i remember seeing that sign in person but never knew the reason. Last time i was in the mall almost everything was closed except for a bookstore i believe. Bradlees was long shuttered and i believe burlington still had an entrance to the mall. A few years after sealing burlington off from the mall they did a much needed renovation to update the interior but the exterior is still the same. Its now super overcrowded and i wouldnt be surprised if they move to the new “lifestyle center” planned behind old navy on dw highway. And i too remember tossing coins in the fountain. Probably the highlight of going to that mall. The pheasant lane was built 2 years after i was born so ive been spoiled by that. I was also never a fan of the royal ridge mall on spitbrook rd. But that memory is a much cloudier one. Oh and i forgot to mention there is now a strictly drivethru starbucks in the parking lot next to kohls that looks like an airport control tower. I remember this mall pretty well. The last time I was in Nashua my wife and I had lunch at the Friendly’s restaurant there. I remember Almy’s and Bradlees and across the way was a big toy store and a Radio Shack. I got my first record play er at the Radio Shack in the late 1970’s. I remember out back the Montgomery Wards that was not attached to the mall but was nearby. I remember seeing the Superman II and the original Star Wars at the theatre there. I never knew this mall existed. I thought the only mall in Nashua New Hampshire was The Pheasant Lane Mall. One interesting thing about Brookstone being in there was that Brookstone was (until their 2005 buyout by a Singaporean company) based in Merrimack and used the Nashua Mall store in several ways. Most Brookstone stores fit one of four or five decorating styles — the Nashua Mall store had all of them represented in order to allow for product photography representing all of the display options. They didn’t mind that the store was less than busy near the end, as it served other purposes. There was a tobacco shop that smelled heavenly. Shoe store McCanns or something? Town and Country Pharmacy was next to Alexander’s grocery. Gloria Stevens fitness was over that way as well as Topiary florist. I think my first dentist, dr. Porzio had an office there as well. @Sharon, i did too!….i spent many, many hours there…this article really ticked off….about how bad the mall was! @Sharon, The record Store was Strawberries (get your WCOZ tshirts out folks!) after MaleStop closed (like a Levi’s store) The rest you are dead right on…there was a laundromat in the corner, and Brothers Pizza was closest to Lincoln Park. Almy’s had a “home Chemistry section” that I swear you could have sourced the ingredients for Thermite in, along with various formaldehyde soaked critters for dissection. If you ran up the hill behind Monkey wards, by the concrete segments keeping the sand from rolling onto the lot, you came out across from my folks house. Oh my goodness, I am enjoying everyone’s memory! I’d forgotten most of it – we lived within walking distance, or a 5-min drive, so the Nashua Mall was our first shopping choice, and the place where the kids hung out. I really miss Child World -it was SO convenient for Christmas shopping. And the movie theater!!! I took my little brother & sister there so see the first Star Wars movie, on my college summer vacation in 1977 – I SPED back down route 3 after, feeling like a Jedi! The shoe store WAS McCaan’s, but there was another one there too, run by a local lady – Dana’s? The record store was Strawberries. The little kids loved to eat at Friendly’s then throw a coin in the fountain. The nearby elementary school – Broad Street – chorus used to sing in the mall for Christmas. The mall was a PTA sponsor. There was also pharmacy in the mall – CVS? And dragging the kids away from the lure of Fanny Farmer’s candies!! Really, the place met all our local basic needs, so we didn’t have to drive up Amherst Street, or down crazy DWH. I really do miss the old mall. I have a 5G Ipod Nano. I will go in burlington coat factory and look out the glass windows with my ipod rolling tape. I have so many memories of the Nashua Mall!! The Friendlys was the best, and went through many renovations, had great waitstaff, we went there until it closed. My friends and I always loved the CVS that was there. Balsams, Doctor Pet Center, Nugents, etc. My first ‘real’ job was at CWT. There was also Anderson-Little clothing, Booksmith, a travel agency, some kind of framing/photo store, a leather/luggage store, a vitamin shop, a hair salon (forget the names)… The shoe stores were Thom McCann and Fayva. And don’t forget the awesome Christmas displays with the mechanical elves! Aww I really miss it. Oh, man, the Nashua Mall! That certainly brings back memories. I used to love that place as a kid–probably because of Child World, I’ll admit. That was always a much better toy store than Toys ‘r Us (and my mom agrees). It was always so neat looking inside, too, what with the neat fountains (always so full of coins!) and wood paneling. I remember Booksmith (people used to call it Paperback Booksmith, although I don’t know why; it certainly wasn’t on the sign by the time I was old enough to care) and I believe Irish Cottage was there for a long time, even past when everything was relegated to that strip mall in the back. I remember driving around the parking lot and just looking around near the end; at one point the other part (the Alexander’s/Shop & Save one–funny, when I think of Alexander’s, I think of Derry Rd. in Hudson, I think that one lasted longer) was completely empty except for Radio Shack. It was like a ghost town. And of course, across the parking lot was Denny’s and Shorty’s and the movie theatre–I think it was Cinema 8? The Nashua Mall was under construction the year I was born, so it was a big part of my life when I got older. I worked at the Nashua Mall Cinema, a General Cinema originally with two screen, when I worked there ’84-’88 it had four. Denny’s was my first coffee shop. Paperback Booksmith (yes, the signs once included “paperback”) was my first book and record store, later as a teenager Strawberries was where I spent many paychecks on cassettes and later CDs. Alexanders Supermarket had a bakery next door to the market and it smelled great. I also had my ear pierced at the mall and when I was very young I shoplifted gum at the Tobacconists and was caught by my mother. Although I no longer live in New Hampshire, I spent most of my years growing up in Nashua. 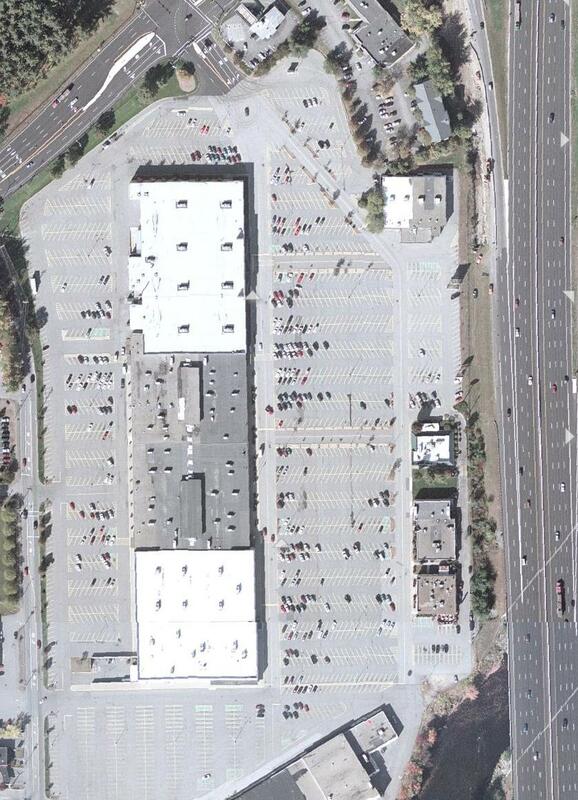 I also have very fond memories of the Nashua Mall. I still remember Bradlee’s and Burlington Coat Factory especially. Back in the late eighties and early nineties, there was this community sentiment that the Nashua Mall existed to service all of your retail needs. For example, if you needed a new coat you went to Burlington Coat. If you needed shoes, stationary items, school supplies, or even some household items you went to Bradlees. I also remember Strawberries Records, Bank of NH, CVS, Balsam’s Card and Gifts, Fannie Farmers, Irish Cottage, Thom McCann’s, and Poore Simon’s. I believe there was also a trendy women’s shoe store there as well once. I also remember that there was a pet store and travel/luggage store as well-just can’t recall the names. No one over the age of 30 will probably ever forget Child World. I still remember Alexander’s from around 1985 to 1988 with its original blue and yellow company colors and the adjacent Alexander’s bakery which always had a pleasant smell. Also, does anyone remember the soccer sports store that also exhisted in the adjoining Nashua Mall Plaza? @Cale, my first Cabbage Patch Kid doll circa 1983 came from that Child World! I lived on Amherst St. a stones throw from the Nashua Mall, and my brother and I used to walk down to the mall quite a bit. Nashua has been an anchor town for my family. Now I live close to the defunct Simoneau plaza. I remember walking around a pretty empty woolco before it closed and became bradlees, much last minute christmas shopping was done at the mall and then lunch was either Dennys or Friendlys. We saw most movies at Nashua cinema or the Brandt downtown. I have too many memories of these places and I miss the way it used to be. Does anyone remember the luggage store’s name in the Nashua Mall? @Susan, I think it was call Jordan’s. I remember all of those stores! I found this site looking for any old pics of Child World. I remember the bakery right next to the market. It was always a special treat when our mom or dad brought us there or to Monkey Wards where they had a candy counter lol! My mom worked at Olan Mills. I knocked a swing set in to the road swinging like a silly kid of course. I remember the Irish Cottage and all the stores listed. I miss the cigar smells and the Santa visits. So sad that time waits for no one and bigger and better stores were built. I wish they had kept it a strip mall and just added on to it and renovated. The Starbucks you can go inside though. I have been many times. I miss the old stores. Nostalgic though to read everyone’s memories. I think you’re talking about Wilson’s which moved to the Pheasant Lane mall. Don’t forget Dr. Pet, Players, Orange Julius, Rooks, Friendly’s or Anderson Little -Yup, I was a 70’s Nashua kid. The Nashua Mall was the place to spend a Saturday. I am shocked at how we could spend 3-4 hours there. My mother and I could always be found there. Bradley’s had the best selection of Hot Wheels and Matchbox cars. Lunch was a choice of Friendlys (mom could smoke inside! ), the diner at Almys or the restaurant at Wards. Don’t forget about the film developing shack in the parking lot! How well I remember this mall. I can picture it in my mind, straight-shot corridor with a blue tiled water fountain in the center that was always filled with pennies. A couple of outstanding memories… we had a family photo taken in that mall in 1978, the photo is so 70’s looking with a fake background but I love that photo… there was a pizza place and I remember my mom and I eating in there, must’ve been around 1983 or 4… Saw the movie E.T. there when it came out (although I’m fairly certain that the cinema was actually next door to the mall)… George Bush Snr actually made a re-election campaign stop there in ’92 and my mom and I went to see him, we waited a while but he finally appeared, came through one end, then down the corridor, I was expecting him to make a speech when he got to the end but no, he just exited out the far end of the building. I was disappointed but I did however get him to sign a dollar bill for me on his way past. I still have that dollar bill, and of course my memories of that old gem of a mall. @Dave, a correction to my posting, I asked my Mum and she confirmed: George Bush Snr did NOT appear at the Nashua Mall it was in fact the Bedford Mall some 20 miles further up the road. @Bryan Donovan, that’s where I learned to drive too!! My sister milked a cow at a contest they had on the farm before it was a mall. The good ole’ days!! No one has mentioned the Haluwa Chinese/Polynesian restaurant yet, which still exists across the parking lot from the once-Nashua Mall! I’m convinced that Polynesian Chinese restaurants exist only in New England — and Haluwa has been there at least as long as I’ve been alive (going on 36 years). Strongest Mai Tais I’ve had anywhere. Note to Webmaster: Web link for “From Woolworth to Wal-Mart” needs updating, if the website still exists. I was born in 1964 and my Mom loved that place, so we went there a lot. I always thought it was weird that a NH Fish Farm was across the road from the mall, but as it was farmland previously, it all makes sense now, lol! In the beginning, the mall was beautiful. The fountains had lights and the Christmas Decorations were awesome. It was a novelty to shop inside during the winter! I have a lot of family memories of this mall. My grandmother took me to the Deerings ice cream shop there (Friendly’s, maybe)? I believe Deering had opened in Downtown Nashua originally, near the phone company where my Dad worked, and a 20th Century Supermarket. When the Deering in the mall opened, the downtown location closed. I don’t remember Bradlees as an anchor store there, however. I remember Bradlees in the Simoneau (SP) Plaza, along with Grants (other side of town). I remember KMart at one end of the original mall. They had blue light specials, which I thought was a brilliant marketing idea – still do. Gets people moving around the store! They should do it at the malls, now. Anyway, that Kmart had these huge round air vents in the ceiling. They used to scare my sister when she was little – she thought they would get sucked up by them! I think Burlington Coat factory still has the original brick outer walls of the mall – painted over. To my childhood eyes the only thing the Nashua Mall lacked was an escalator. Jordan March in Manchester had an escalator, which I used to ride every time my mother’s back was turned! That building, now Macy’s is closing for good. I went back a couple months ago, and took pictures of the escalator. I miss Fannie Farmer’s Easter Eggs. Like Cadbury’s but huge! I also remember Anderson-Little and Thom McCann’s in the mall, but we always bought our shoes at the Tom McCann outlet store, down by the old Nashua/Hudson bridge. That old bridge scared me to death – it was more holes and rebar than concrete by the time it was replaced with the first of the twin bridges to Hudson. I learned to pray to God as a child, crossing that old bridge! Does anyone remember the store in downtown Nashua that had the ceiling “racetrack”, that took your money to the store accountant, instead of using a register? I don’t think it was Miller’s (now Alex Shoes). Does anyone remember? It was fascinating to watch the money, in a little canister, travel all around on the ceiling, drawn quickly by a chain contraption.